Rebalancing a portfolio is a very powerful concept. It allows the investor to systemically sell high and buy low. Index investors do that regularly and there are no reasons why a dividend investor cannot do the same and it doesn’t have to cost much in fees either. Make sure you have a good discount broker with low fees such as Questrade. 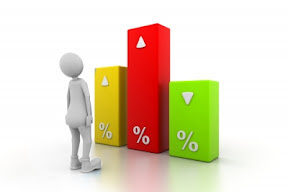 To rebalance, you need to start with a set of targets for your dividend income portfolio. Setting sector targets work best. Considering I personally have over 30 stocks, I could not imagine setting a target for each of my stocks. It’s a lot more manageable to set targets by sector since you can group stocks within a sector. You may decide to have only 1 per sector and that works too. Over time, any investor will start diversifying within a sector just to minimize exposure. Here are my targets for your reference. I have 10 sectors at the moment and it may change over time at which point I would adjust my sector targets. It’s what I am comfortable with at the moment. Those targets only represent my dividend portfolio. My defined contribution plan at work is simply indexed – not really any other options. Now, where do I stand? The graph below shows my current ratio and my expected target. I am heavy in financials and I have always known it. The reason is that I started building my portfolio with many financials and I only diversified by adding new money as I feel very confident in the Canadian banks. Based on my desired target, I will be adding to the utility sector in the new year when I add new money and I also expect to add to the bonds sector in the new year. Those will be my priority. The simplest trigger is once a year. If you are investing in stocks, chances are you look at your portfolio a little more often than once a year and I would recommend to do it at least once per quarter. The fees for selling and buying should not be too costly on your portfolio and 3 months is a decent amount of time for a market to move. If you are going to pick a rebalancing date, I would recommend you pick May or October as they have represented the annual highs and lows as referred to by the expression “Sell in May and Go Away“. 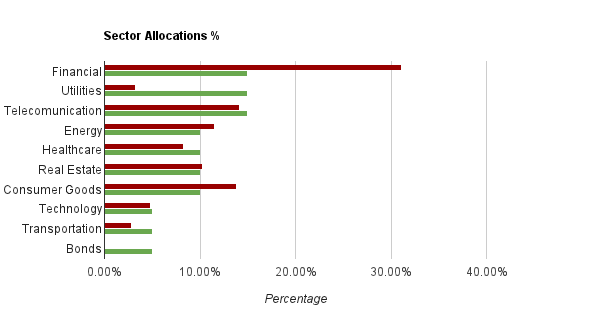 Another trigger is to set a percentage variation for each sector to decide on rebalancing. For example, if your target is 10% for the transportation sector, you could decide to rebalance with a 3% variation up or down. If your sector reaches 13% or 7%, you would look at selling or buying. The challenging part is that it doesn’t mean just one other sector moved. You could have 6 sectors all moving slightly and you don’t want to rebalance them just yet… You would have the option to sell for cash or to inject more cash if you did not have any as part of your allocation. You don’t always have to sell in order to rebalance, sometimes you just have to add some funds. It’s a matter of planning how you want to rebalance. You don’t want to sell 10 stocks worth $100 and pay $10 in commission, it just doesn’t make sense. When it’s time to rebalance, you might not actually be able to do it efficiently and you just need to plan it. My portfolio is above $100K now and most of my investments have $5,000 or so. With a 10% to 20% differential target, I tend to trade $1,000 and it makes the $10 commission represent a small percentage to lock in some profits. It’s also important to have a look within a sector to see if anything should be adjusted. For example, you could own the 6 major Canadian banks for your financial sector and depend on when you purchased your stocks, you might want to rebalance between them. If I look at my portfolio, Toronto Dominion (TD) and National Bank (NA) are doing better than the other banks. At some point, I could take a profit and add to another bank. It usually means you invest in a higher yield bank too if one is lagging behind the others. I don’t tend to do anything until a stock is consistently 20% above my purchase price. At that point, I will evaluate if it’s time to take a profit for the benefit of another investment. I already did that with Crescent Point Energy (CPG) and Liquor Store (LIQ). Rebalancing is a powerful concept that takes the emotions away from investing and let you reflect on the ups and downs of your holdings. I find that investing is very much about the process and your diligence to stick to a plan as opposed to finding the next gold mine.